There was a time when you could buy a heavy-duty Chevy Suburban from a dealership, with diesel power and healthy payload and pulling capacity to go with it. Now, GM won’t sell them to civilians. But independent outfits are doing the lord’s work and making their own. To be honest, it’s hard to imagine how much of a practical advantage a one-ton diesel Suburban would have over a readily-available similarly-equipped Silverado pickup. Besides, I guess, the two extra seats. And exclusive awesomeness. Government agencies like the Secret Service have used Suburban HDs for their ability to haul a lot of personnel, armor and equipment. You might be able to justify one if you fill seven seats with family members and a roof full of luggage with a boat on the trailer hitch regularly. Or if, like so many of us truck fans, you’ve decided diesel Suburbans are awesome because we can’t have them. But, actually, you can. 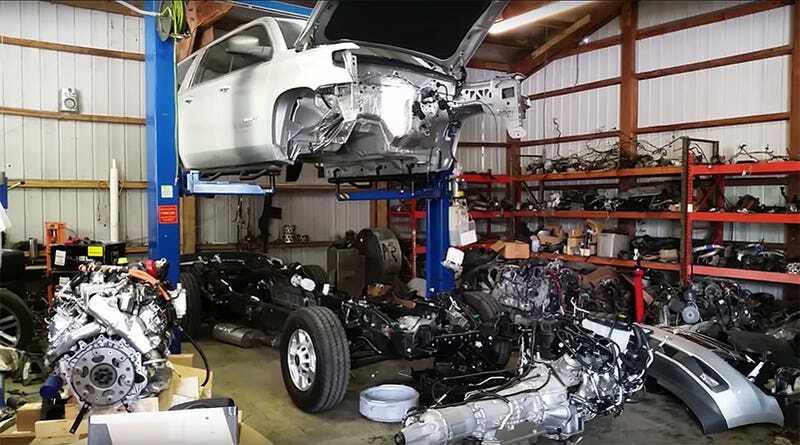 DuraBurb is surely not the only outfit in America doing diesel conversions on modern Chevy Suburbans, but it does seem to be one of the most-respected on relevant forums, for what that’s worth. What caught my attention is this strikingly clean 2017 Suburban DuraBurb’s rep Erich Swanson has been advertising that got picked up by Motor Authority. With a Duramax crate engine nestled perfectly into the engine back of a current body-style Suburban and diesel-relevant controls seamlessly integrated to the interior, it looks and apparently acts like the factory Suburban HD that doesn’t exist. The details on this machine are amazing. The SUV’s even got a glow-plug light to let you know when the diesel engine’s warmed up enough to run. That video’s actually really educational about Suburbans in general. I have a feeling GM would refute Swanson’s assessment that “the frame hasn’t changed since 2000,” but it does seem like the guy’s hacked up a fair few of these things. Anyway, I know I want one. We can figure out why later. Hat tip to Joe and Joel at MotorAuthority!